Mark Twain said that history doesn’t repeat itself but it rhymes. This is also true in the markets. No bull or bear market or particular event is ever the same. Yet, because there are similarities, the prudent analyst always studies history. When trying to foresee bottoms and tops we always compare current conditions (price action, sentiment, fundamentals) to past conditions. We continue to believe that the recent bottom in precious metals markets falls into a group of major bottoms that includes 2000-2001, 2005 and 2008. In today’s piece we examine how these markets evolve following such bottoms which hopefully can give us an idea of what to expect in the coming weeks and months. First we show a chart of the HUI, Gold and Silver during the 2005 bottom. For the equities, the 2005 bottom was a successful retest of the 2004 bottom. 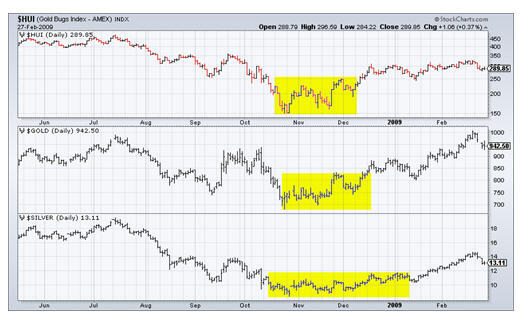 Gold and Silver actually bottomed in terms of price in May 2004 and made a higher low in early 2005. The metals showed relative strength prior to the bottom while the shares emerged first after the bottom. It’s important to note that no long-term technical damage was present in any of these markets at the time of the 2005 bottom. We should also note that while the HUI and Gold confirmed their bottoms within months, Silver didn’t close above its initial high (early June) until October. Next we look at the 2008 bottom. The precious metals markets broke to multi-year lows (ex- Gold) and reached a historic oversold reading amid significant technical damage. Again, while the HUI and Gold bottomed and confirmed the bottoms in a span of six weeks, Silver didn’t break out of its base until January. The 2000-2001 bottom is somewhat of an outlier. The equities bottomed first in late 2000 followed by Gold which bottomed a few months later. Silver didn’t bottom until a year after the equities bottomed. This was the end of a generational bear market and thus, each market was extremely oversold and rebounded from great technical damage. The equities quickly embarked on a significant bull move while the metals lagged for months. Turning to the present, the gold equities are in the lead again while Silver is the laggard. What do the observations of past bottoms tell us about this recent bottom? First, Silver has lagged during every bottoming process. Thus, Silver should continue to lag for several months. 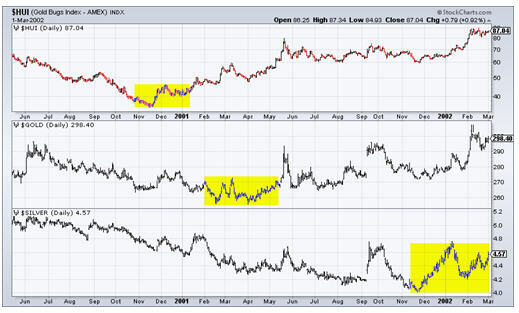 Second, Gold and Silver (unlike in 2001 and 2008) did not break to new lows. They held the December low. This is similar to the 2005 bottom in which Gold and Silver bottomed in May and began a move towards a breakout in September. The HUI typically retests the low within seven weeks. In 2001 and 2005 there wasn’t much of a retest while in 2008 the HUI retested the low about a month after the bottom. Today is about a month after the May bottom and it doesn’t look like a retest is coming. Moreover, while 2005 was a retest of 2004, it came 18 months after the initial peak. In other words, the current bottom has few similarities to that of 2004 which would imply a retest at a later date. 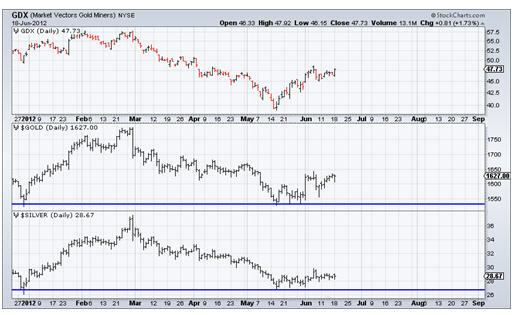 Essentially, the weight of the evidence argues that GDX/HUI is not likely to retest its low. Want more evidence why this is the case? Take a look at the next chart courtesy of TheShortSideofLong. 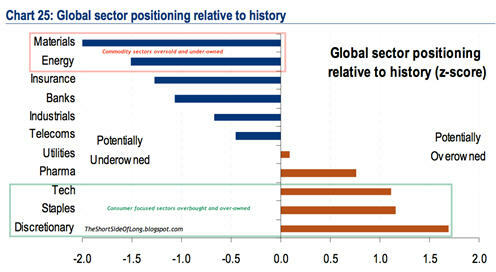 This chart shows the positioning of the respondents in the latest Merrill Lynch fund manager survey. The participants manage $700 Billion. Relative to history, fund managers are extremely underweight the materials sector. Looks like its time for Joe Hedge Fund to dump his Starbucks and tech stocks and buy some gold stocks. The odds are quite favorable that the Gold sector will continue to rebound. Notice that we say Gold sector as history shows that Silver could lag. As we noted last week, the sector has bottomed but its important to know which parts will outperform now and which parts will outperform later. Gold producers lead during the initial recovery. Later, the Silver sector assumes leadership. 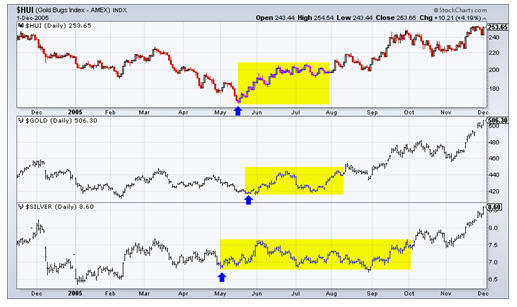 Juniors begin strong outperformance when Gold breaks to a new high. Presently, we continue to focus on the producers and juniors best positioned for and most likely to take advantage of this next leg up in this bull market. Ifyou’dbeinterestedinprofessionalguidanceinthisendeavor, thenweinviteyoutolearnmoreaboutourservice.